The Silver Violet Flame is a mighty tool that we can all use in our daily lives to transmute lower vibrational energies into a higher vibration. The Violet Flame of transmutation was originally available to humanity during the highly spiritual times of Golden Atlantis, but later withdrawn. During the 20th century is was slowly re-introduced for humanity's use. 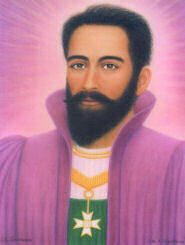 During the Harmonic Convergence on August 16th and 17th 1987 so many Light workers prayed around the world that St Germain asked source for a dispensation for humanity and the Violet Flame became widely available and for use by all. The Flame includes colours from lavender, through lilac to deepest violet. In 1998 the Silver Ray of Grace and Harmony, under the guardianship of Archangel Zadkiel, was made available to humanity and merged with the Violet Flame of Transmutation. This created the Silver Violet Flame of Transmutation and Mercy; increasing its power even further. We can call upon St Germain and Archangel Zadkiel to surround any thought or situation with the Silver Violet Flame and ask for its transmutation into a higher vibration for the highest good of all concerned. All we have to do is to ask for it to enfold and it will be done.  Ask it to blaze a trail in front of you during the day, purifying your pathway.  Send it to people who are sick.  Use it to transmute your anger, fear, negativity or clouds of it in or round others.  Send it to heal disharmony in relationships.  Send it to places to purify the energy of war and disruption.  Send it to your body where you hold physical blocks.  Send it down phone lines or the Internet to purify the web.  Send it to the astral planes to help stuck souls who have not passed over. Diana Cooper has a very powerful degree given to her by Archangel Zadkiel, which if said daily could change lives in unimaginable ways. When you say ‘I AM’ you are merging your lower self with your higher self, your monad and Source. The decree should be said out loud and repeated three times. What would you like to place in the Silver Violet Flame? I was sending absent healing. I invoked the help of Archangel Zadkiel and the violet Flame for my sister Roz. Who had suffered a recent heart attack. Roz had never been ill all her life, not even a cold. She had also recently retired from her work, looking after the elderly..so all this was a blow to her. I saw the Violet Flame cleansing and clearing the blockages to the arteries to the heart and saw it sweep over the whole body and auric fields. Two days later she rang and told me of an experience she had had a couple of days before (the same day as the healing). She had sat down to rest when she heard a voice. She closed her eyes and to her astonishment saw two young angels carrying her heart. The voice said "we are taking your heart away and mending it". When she asked what I thought I explained about Zadkiel and the Silver Violet Flame. Roz is anxious to know more! !